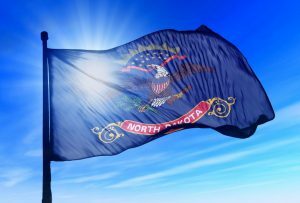 President Donald Trump declared North Dakota’s natural resource development in the Bakken oil fields an “energy miracle” during a speech on his administration’s tax cut plan. Trump made the visit with Sen. Heidi Heitkamp (D-N.D.), who voted against the repeal of an Obama administration methane rule in May. Heitkamp faces a tough reelection campaign in 2018, and her appearance with the president in a state he won by 36 points could signal the senator’s acknowledgement that her vote against oil and gas—particularly in North Dakota—could endanger her political future. “All that red tape becomes beautiful when you get rid of it,” Trump said. Eliminating the red tape by lifting restrictions on energy and ending the intrusiveness of the Environmental Protection Agency, the President said, unleashed the “vast energy wealth” of the state and driving the nation’s economy. Heitkamp’s no vote on the Congressional Review Act resolution to move forward debate on the Bureau of Land Management’s “venting and flaring” rule surprised most observers in the oil and gas-rich state, but represented a “victory for environmentalists,” according to The Hill. Western groups supported repeal of the rule, which would prevent new natural gas wells and limit others, reducing production and tax revenues. 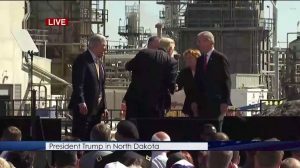 Speaking at the Andeavor refinery in Mandan, North Dakota, Trump was accompanied by the state’s Congressional delegation. Senators John Hoeven (R) and Heitkamp, along with Rep. Kevin Cramer (R), were joined by Gov. Doug Burgum (R). Trump acknowledged Heitkamp, the lone Democrat on stage, several times. Later, Trump said members of Congress who vote against tax cuts should be put out of office by their constituents. “Anybody that is going to vote against tax cuts and tax reforms, whether it’s in North Dakota or any place else, you’ve got to vote against them and get them out of office,” Trump said. “Stop putting party first,” Trump said, arguing bipartisan efforts could succeed, citing tax cuts under the Reagan administration and support from Democratic Sen. Quentin Burdick in 1986. “Are you listening, Heidi? Heidi’s listening. Yeah she heard that. Thank you, Heidi. We’re not going to put her on the spot, I’m not putting her on the spot,” Trump joked. Back in May, Cramer, Heitkamp’s House colleague, had blasted the Democrat after her CRA vote on the methane rule. “Let’s be clear, a vote against this rule is a vote against the workers and families in Western North Dakota,” Cramer said in a statement. “It’s a huge missed opportunity to protect our energy jobs in Western North Dakota and across America, and any senator who voted against this CRA should be ashamed of themselves.” “I hope we see stronger support from our senators for America’s energy industry in the future,” Cramer said. It was clear that the Trump administration saw North Dakota as the backbone of the country’s energy future. The president also acknowledged the opening of the Dakota Access Pipeline and his support of the Keystone XL pipeline during his delivered remarks. “The Dakota Access Pipeline is finally open for business,” Trump declared. “We’ve lifted the restrictions on shale oil, we’ve lifted those restrictions on energy of all types,” he continued. “In order to protect American industry and workers we withdrew the United States from the job-killing Paris Climate Accord,” Trump said. President George H.W. Bush traveled to the Bismarck area in 1989, according to the Washington Post. Gov. Burgum told Rob Port, a North Dakota political columnist, that he was thankful for the President’s visit and said Trump’s message on tax cuts would do well in the state, saying the Republican’s “straight talk” on issues was well-received there.